Kyle Beltran, Ryan Spahn, Jennifer Kim, Catherine Combs in Gloria. Photo by Carol Rosegg. 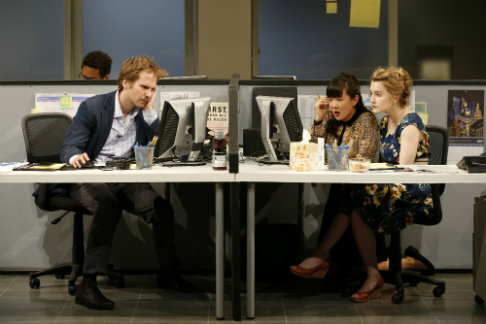 BOTTOM LINE: The oppressive office they all loathe suddenly turns into an obsession for four coworkers in this darkly funny and graphic play. Gloria efficiently titles the play with the name of one of its characters, the one that the rest hinge on intentionally or not. However, as my friend and I did, go ahead and wildly theorize about the title’s other meanings as you watch. Without seeming like a mystery, this new, exciting play by rising star playwright Branden Jacobs-Jenkins does keep you guessing. The curtain rises on a typically placid publishing office, but soon the mundanity of their job ignites a frenzied hate fest from all involved. Disastrous barbs fly out of tired workers’ foaming mouths; there are near fights and there are Starbucks runs. Because their office is so catatonic, the characters relieve themselves with overly emotional diatribes about their place in the universe. These beautifully written monologues drip with self-importance, but also pierce us with relevance and truth. The audience knows it and so do the characters. Though Dean (Ryan Spahn) is a veteran assistant he is stuck in the rungs, expecting the bottom to fall out. He is also on the cusp of thirty and nowhere near his 5-year plan. The important 5-year plan, as introduced -- but not followed -- by the ambitious Kendra (Jennifer Kim), is elusive for all including the spritely intern Miles (Kyle Beltran) and the distraught head fact checker Lorin (Michael Crane). Whereas Miles has permission to explore, Lorin, at thirty-seven, feels the weight of his choices, particularly his decision to major in French. These questions of status fall rather flatly on new hire Ani (Catherine Combs), who rests in her ability to write code and have a future as an engineer; still, she stays in the office because it’s slow. Comically, we never see the floor supervisor, Nan, in the first act but we definitely notice Gloria (Jeanine Serralles), a painfully awkward copy editor who just hosted a housewarming party for her new condo, to which no one came except Dean. This is where our play begins. Office culture is gloriously imagined at a static magazine. Three assistants sit at narrow cubicles, facing each other for increasing chances to annoy one another. The white walls and transparent conference rooms or offices behind them speak of sterility. It’s hard not to think of an asylum when you see the set. Not dark "American Horror Story," but calming Sanitariums where anxious people are calmly lobotomized. Akin to disgruntled patients, these coworkers will not go silently. Kendra, played especially nasty Kim, never shies from revealing her insights for she believes it’s all in the service of her coworker’s goals. Of course he’d want to know he’s a drunken loser! There to placate her is Ani, in a cool portrayal by Combs. Combs is emotionally even in this first act, which serves the erratic interplay well. There is a considerably funny moment when Kendra and the forlorn Dean, a spectacular turn by Spahn, are in the middle of a screaming match; Combs’ Ani sits back, smiling, almost giggling at it. Kim’s portrayal is unflinching as she mows down person after person. Though she and Combs dissolve tension when they mourn the death of their favorite adolescent rock star, Kim jumps back to her myopia at the next beat. Spahn’s Dean is equally exhausting as he loathes. These two supernovas create some wonderful tension in the first act, unknowingly taking our attention from other broilers. Like what’s up with Lorin? As he comes back and forth to hush the assistants, he finally breaks, making for a great moment. In contrast is Beltran's inquisitive and sweet Miles. Beltran’s Miles exists outside of his superior’s chaos and so his arc is a surprising one. In fact, the character changes at play’s end are amazingly deep. Jenkins writes tight plot knots of which it is impossible to get out. He takes us on a stellar tour through an imagined hell, though it wouldn’t seem like it. As we’re introduced to Gloria, a stunning portrayal by Serralles both creepy and profound, we understand our fears of mundanity. The play’s action explodes onstage. Short of giving a spoiler I will only say Act II gives credible resolution to a dynamic first act. (How was that for vague?) But you wouldn’t want to know what happens from this review anyway. This play exists in two times, as it were. The plot points I could list which propel the story are not the only plot points. They would dismiss Kendra’s amazing monologue about the Baby Boomers’ leech-like hold on upward mobility, or Miles’ scary knowledge of depopulation in Africa. We would miss the daily absorption of a day at the office, the petty upsets, and the gnawing craving for a shot of espresso. Instead as we move from the New York magazine’s office to a Starbucks and finally to film studio offices in Los Angeles it’s only deep because of the surface stuff. Your temp job matters to how you relate to humanity, it seems, casting dire implications on our realities. Scenic designer Takeshi Kata and costume designer Ilona Somogyi give us ample realism with their absorbing designs, for example. Kata’s sets are eerily similar to offices and coffee shops we know. Yet, I was struck with how open the LA office was as opposed to our beginning setting. It almost spoke of the air out there and of possibility; you could see the sunshine. Somogyi’s costumes are chic and, well, office appropriate, but also tell us about the character’s status: orange mules versus dingy cords, disheveled executive versus tidy intern. With the clothes there is a nod to power and the uncertainty of who has it. Under Evan Cabnet’s direction this play soars. Already blessed by a mellifluous script by Jenkins, Cabnet winds the knots even tighter, asking his cast to push, push, push. Even a simple “What?” is charged to the max. Gloria, like a classical movement from Handel or Vivaldi, makes the mundane sublime. With its superb action and witty yet emotionally moving script the play takes us on an exhausting and exhaustive journey. With the pulse of the first act, the rest of the scenes ripple hoping to come to stasis; and the audience hopes, nay prays, too. 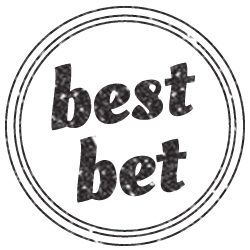 Brace yourself for an unassuming play that packs a wallop. This piece represents how good off Broadway can be.